The data are trickling in, and with each passing day it seems more certain: 2014 is going to be an El Niño year, and probably a big one. What does that mean for your Western state? First, a quick primer on the science behind The Niño. In normal years, prevailing winds in the Pacific Ocean push warm water to the west, toward Indonesia, leaving space for deeper cold water to rise off the coast of South America. When those trade winds slacken or about-face – a phenomenon that appears to be occurring right now – fasten your seat belts and prepare for a bumpy El Niño ride. The reversed winds drive warm waters eastward and up toward the ocean’s surface, where they come into contact with the atmosphere, increase air temperatures, and send global weather patterns haywire, generating storms, droughts, and heat waves. Voila – you’re a meteorologist! While it’s still a little early to be making definitive predictions about the magnitude of the coming El Niño, it may turn out to be a beast to rival the 1997-98 event, which cost the U.S. an estimated $10 billion in storm damages and crop losses. (Although El Niño typically transpires every two to seven years, climate change could be increasing the frequency of super-strong events.) As Eric Holthaus explained in Slate, the subsurface blob of warm water now drifting toward the Americas is enormous – large enough to cover the entire United States to a depth of 300 feet. That immense anomaly could make 2014 the hottest year in recorded global history, and 2015 might be even steamier. Every El Niño is different, of course, and extrapolating from previous events involves a whole lot of semi-educated guesswork. As some sage once said, “It’s hard to make predictions, especially about the future.” With that caveat out of the way, let’s comb through the historic record to understand what havoc the coming disturbance might wreak upon the American West. Alaska: South-central Alaska – looking at you, Anchorage, Homer, and Seward – should be in for a balmy winter. That’s bad news if you’re among the mushers bound to slog through another miserable 975-mile Iditarod dog race, and good news if you’re one of Anchorage’s ubiquitous reindeer-dog vendors, who should do unseasonably brisk business as lunch-eaters venture outdoors even in the depths of February. Arizona: Back in 1997 and ‘98, the largest El Niño in recorded history dumped a whopping 136.7 inches of snow on Flagstaff – 43 more than usual. And that city was far from alone: past El Niños have brought above-average precipitation to every corner of Arizona. So 2014-15 should be a bountiful period for the perpetually water-stressed state. The Colorado River could get used to this whole reaching-the-sea business. During an El Niño year, the jetstream ducks further south than usual, conveying heavy rains to California. Image courtesy of NOAA. California: If there’s one faction sure to welcome El Niño with open arms, it’s California farmers, who have spent the last year locked in the mother of all droughts. El Niño should provide some welcome relief: During past events, the jetstream has migrated south into California, bearing ample rain. In fact, Cali could go straight from drought to flood, as torrential storms in 1998 destroyed homes and forced the evacuation of towns. At least sport fishermen will be satisfied: the warming Pacific conveys exotic gamefish to the California coast. Colorado: Interesting news for Front Range powder-hounds: According to the National Center for Atmospheric Research, 20-inch snowstorms are almost twice as likely to occur during El Niño years as neutral years. Most monster storms, though, hit during spring and fall, while mid-winters are relatively dry. Bust your skis out early and don’t get discouraged by a snow-free January – a late-season blizzard could be just around the corner. Idaho: Brace yourself, Idahoans: you’re in for a dry winter. Hey, don’t shoot the messenger – check out the below map. The same meandering jetstream that brings rain to California tends to shift wet weather away from the Pacific Northwest, Idaho included. Plenty of precipitation fell on the Gem State this winter, so hopefully the reservoirs contain a bit of a buffer. Green areas receive more rain during El Niño years; brown areas receive less. Image courtesy of NOAA. Montana: If you think Idaho looks brown, take a look at Montana. Yikes. Expect lots of scraggily-bearded ski bros grumbling into their Moose Drools about the lack of powder on the slopes around Whitefish. The meager snowpack could also mean a tough 2015 for lynx, wolverines, bull trout, and other species already imperiled by the climate change-induced demise of what’s soon to be Ex-Glacier National Park. Green bars represent unusually wet winters during El Niño years; brown bars represent unusually dry winters. Each set of bars represents a different region of New Mexico. Wet winters are clearly more common than dry throughout the state. Image courtesy of NOAA. Oregon: Oh look, another northwestern state that’s in for lackluster snowpack. El Niño years tend to produce lower stream flows in the Columbia Basin, spelling trouble for dam operators and fishermen alike. Gulp. Utah: In the Beehive State, El Niño’s impact is going to be… well, pretty minimal, actually. As National Weather Service hydrologist Brian McInerny explained, Utah is wedged between the Northwest, which gets drier, and the southwest, which gets wetter; the upshot is that the state experiences little overall signal. So raise a glass of 3.2 percent ABV beer, Utahns: while the rest of the world is trapped in a collective El Niño freakout, you guys can just keep on keepin’ on. Washington: Inflicting floods and drought is one thing, El Niño, but when your warm waters start messing with salmon, you’ve gone too far. Previous El Niños have been blamed for increased mortality and decreased growth in Pacific salmon; in 1994, the salmon situation became so dire that the federal government declared it a disaster. Columbia Basin returns have spiked in recent years, partly thanks to favorable (i.e., cool) ocean conditions, but don’t bank on another epic run of fall Chinook in 2015. Wyoming: Another state due for a bone-dry El Niño experience. That’s nothing new for Wyoming, which has spent most of the last 15 years in varying degrees of drought. (See below.) For the state’s ranchers, El Niño portends more of the same – diminishing hay stocks and corresponding price increases – except maybe worse. Bummer. The percentage of Wyoming that has experienced drought since 2000. The darker the area on the graph, the more intense the drought. It's been a dry decade-and-a-half. Image courtesy of Wyoming State Climate Office. 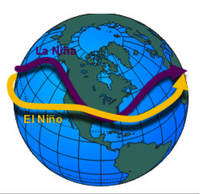 So there you have ‘em – your fearless, west-wide El Niño predictions. And if our forecasts don’t jibe with your memories of El Niños past, let us know in the comments. Ben Goldfarb is an editorial intern at High Country News. He tweets @bengoldfarb13.